I have been a speaker and/or an attendee at hundreds of conferences and events and it often surprises me how many presenters are happy to stand behind a lectern and deliver a speech; it really doesn’t do them any favours when it comes to communicating their message effectively. It can also look ridiculous if you're short like me as the photo above taken at Royal Bank of Scotland Conference Centre shows. Compare that with the image below which really highlights the difference stepping out from behind the lectern can make. On stage at RBS - away from the lectern! I don’t know about you but as an audience member I always find that talks and presentations delivered without the lectern are far more engaging; the speakers may make themselves more vulnerable but there is power in that. As a speaker I like to move about the audience where possible and when I do so I find I get a much better connection with people. There are of course challenges with that, such as moving out of the light, away from the microphone or out of camera shot if it is being filmed. However, if the organisers know in advance that you want to step out from behind the lectern they will usually be keen to make sure you have this option; just make sure you give them plenty of notice of your requirements and always ask for a lavelier microphone where possible to give you the most flexibility. 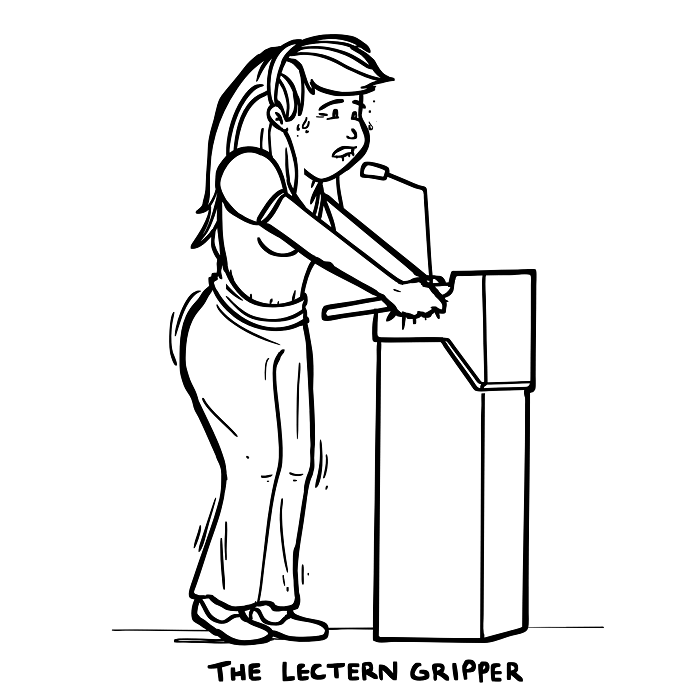 Are you a Lectern Gripper?